Increasingly, government leaders recognize that solving the complex problems facing America today will require more than simply keeping citizens informed. Meeting challenges like rising health care costs, climate change and energy independence requires increased level of collaboration. Traditionally, government agencies have operated in silos -- separated not only from citizens, but from each other, as well. Nevertheless, some have begun to reach across and outside of government to access the collective brainpower of organizations, stakeholders and individuals. 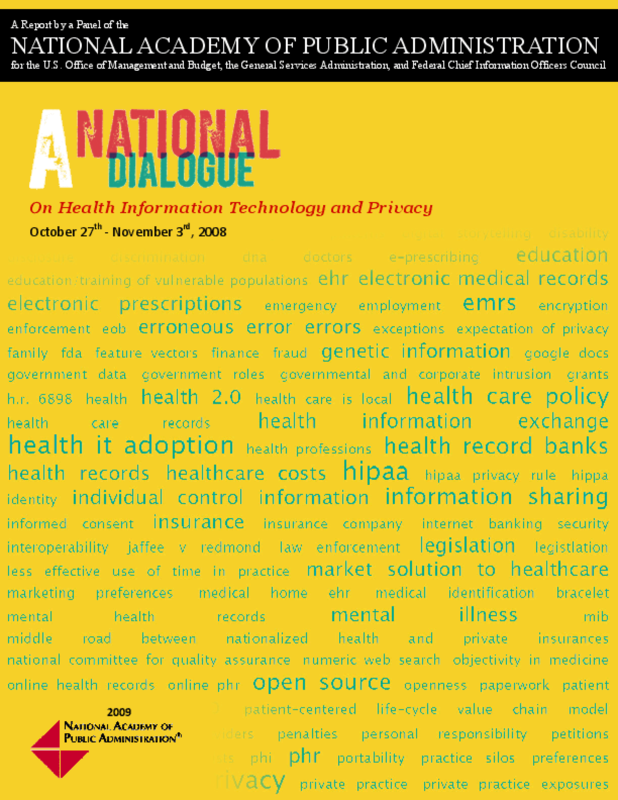 The National Dialogue on Health Information Technology and Privacy was one such initiative. It was conceived by leaders in government who sought to demonstrate that it is not only possible, but beneficial and economical, to engage openly and broadly on an issue that is both national in scope and deeply relevant to the everyday lives of citizens. The results of this first-of-its-kind online event are captured in this report, together with important lessons learned along the way. This report served as a call to action. On his first full day in office, President Obama put government on notice that this new, more collaborative model can no longer be confined to the efforts of early adopters. He called upon every executive department and agency to "harness new technology" and make government "transparent, participatory, and collaborative." Government is quickly transitioning to a new generation of managers and leaders, for whom online collaboration is not a new frontier but a fact of everyday life. We owe it to them -- and the citizens we serve -- to recognize and embrace the myriad tools available to fulfill the promise of good government in the 21st Century. The Panel recommended that the Administration give stakeholders the opportunity to further participate in the discussion of heath IT and privacy through broader outreach and by helping the public to understand the value of a person-centered view of healthcare information technology.